Welcome to our complete guide to crate training a puppy. 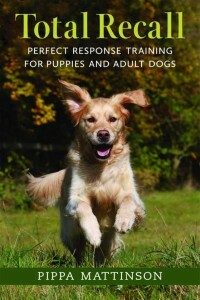 By professional expert dog trainer, Jo Laurens. Giving you all of the crate training information you are looking for. Find out what crate training is and how your puppy could benefit from having a dog crate. We take a look at whether using a crate is cruel, and how to make sure that your puppy is safe, happy and healthy in his special bed. And give you the answer to those important crate training puppy questions, such as ‘how long can a dog stay in a crate’, ‘how big should a dog crate be’ and ‘which crate is best for my puppy’. ‘Crate training’ a dog, is the process of teaching a puppy or dog to relax and feel comfortable in a dog crate or dog cage. Many new owners don’t realize that there is a training process behind successful use of crates. Instead, they just put the pup in the dog cage – and then are horrified by the noise and distress! They struggle along with the crate for a couple of days, and then give up. This is a real shame, because crate training a puppy has huge benefits. And can have uses at different points throughout the lifetime of a dog. Sometimes new dog owners think crates sound ‘cruel’ – after all, they are cages. They conjure up thoughts of prison and animal testing, and other ideas we don’t like. If you find yourself thinking along these lines, try to see the ‘dog cage’ from your dog’s perspective. Dogs are den animals, since their nearest wild relatives – wolves – live in small, dark, enclosed spaces dug into the ground. When scared, many dogs choose to run under tables or behind furniture. Showing that they still have similar preferences to wolves when it comes to their definition of ‘a safe hiding place’. To consider a crate ‘cruel’ is to see it from a human perspective and to apply human values to it. A quick look at crate-trained dogs whose daily needs have been met, will show you lots of snoozing, happy pups in their crates. Or pups quietly chewing a Kong. It’s clear that there’s no cruelty involved, for these guys. However, crates for dogs can be abused. Leaving a puppy or dog in a crate for too many hours a day, is not recommended and may well constitute cruelty. We’ll look at how to be sure to avoid this happening later on. But first, let’s check out the pros of puppy crate training. Dogs are creatures of habit, and once they start to do something (desirable or undesirable!) they are likely to continue with it. So, one of your goals, in bringing your puppy home, is to encourage, reward and develop the behaviors you want. And to prevent the behaviors you don’t want. Unsupervised puppies, left loose in your house, may be prone to destruction. Chewing your furniture or belongings (including electrical cables); toileting inside; raiding kitchen counters for crumbs; and consuming dangerous substances. Obviously only some of these activities are dangerous. The rest of them are a problem because, the more they ‘practise’ doing these things – the more they will do them! Puppies will try to hold onto pees and poops, in a crate – because it is their ‘bed’, and they naturally don’t want to soil where they sleep. That means you can get on with the cleaning, cooking, accounts, piano practice, school run, [insert activity], safe in the knowledge that you’re not going to return to a mess. When you return, you can whisk Fido outside quickly and thereby avoid any accidents in the house. The fewer the accidents, the faster your puppy potty training with a crate. All your precious belongings are out of the puppy’s reach. It’s therefore not possible for the puppy to make the ‘wrong’ choices about what to chew. Anything potentially dangerous is out of the puppy’s reach. Once your puppy is crate-trained, you can bring a crate with you when travelling and your puppy will have a ‘home-from-home’ in the hotel room. If your puppy ever has to go to the vets for a procedure or surgery, she will be crated in a dog cage before and afterwards. If she is used to being confined in this way, she will be much less stressed before and after her surgery. Sometimes, due to illness or post-surgery, exercise has to be restricted for some dogs. If your dog was crate-trained as a puppy, crating itself will cause no stress. My elderly dog had spinal surgery a couple of years ago, and needed crate rest for a few weeks afterwards. The idea of trying to crate her, had she never been crated before, would be unthinkable at a time of such illness. So, we are fully sold on the benefits of crate training a puppy. The next question is, what crate is best for my puppy? What type of crate should I buy? 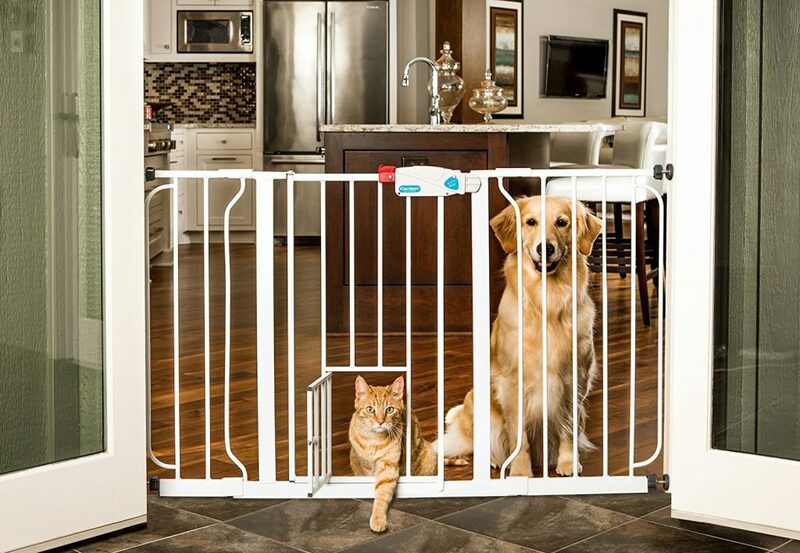 Crates for dogs can be made from different materials, with the most common type being a metal/wire dog cage. Also available are solid plastic crates, most often used for air travel. There are also soft fabric crates. I would recommend a metal crate for most new puppy-owners. These will collapse flat for storage or transportation. Solid plastic airline crates can also work well – but they don’t collapse flat, are bulkier, and they also tend to be more expensive. 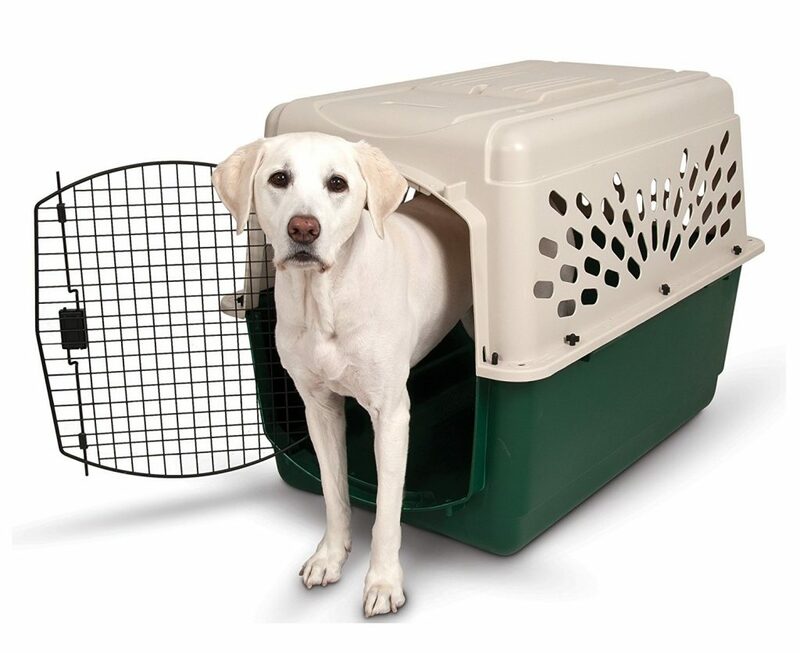 Fabric crates for dogs are great for travel purposes – they are lightweight, collapse easily, and transport well. But they can also be torn or ripped by sharp puppy teeth and claws, so they are not a good choice until your puppy has already learnt to relax in a dog crate. Fabric crates may also be harder to clean, if your puppy has any toilet accidents in the crate – so, again, wait until toilet-training is complete and your puppy is older before trying a fabric crate. Once you have chosen the best type of dog crate for your dog and your needs, you will need to make sure you choose the right size. When choosing a puppy cage, make sure that it’s not too large. If a crate is too large, a puppy will be quite happy to toilet at one end of it and sleep at the other(!). You need the entire crate to ‘be’ the puppy’s bed, so that the puppy is reluctant to toilet anywhere in it. Your dog should be able to stand up and turn around comfortably. Many puppy crates come with dividers which can partition off part of the crate and be made larger as your puppy grows – making a large crate any size you wish. Or you may need to purchase a small dog crate until your puppy grows into the larger crate. Puppies (and dogs) have certain needs which must be met, daily. The needs of a young puppy, and those of an older dog, differ – with a puppy’s needs being far greater. Each day, a puppy will need to be taken outside to toilet frequently. At a very young age, this may be as frequent as every 30 minutes. A puppy will need at least three meals a day at 8wks – sometimes four meals a day. Your puppy will need socialization. A trip to a new location; meeting new people; meeting suitable other dogs – and much more. Along with travel time, and short naps, this outing could take a couple of hours a day. He will need brief sessions of daily training, working on basics – like sit, down, loose-lead walking and more. And – most importantly – a puppy will need human companionship for a decent proportion of the day. 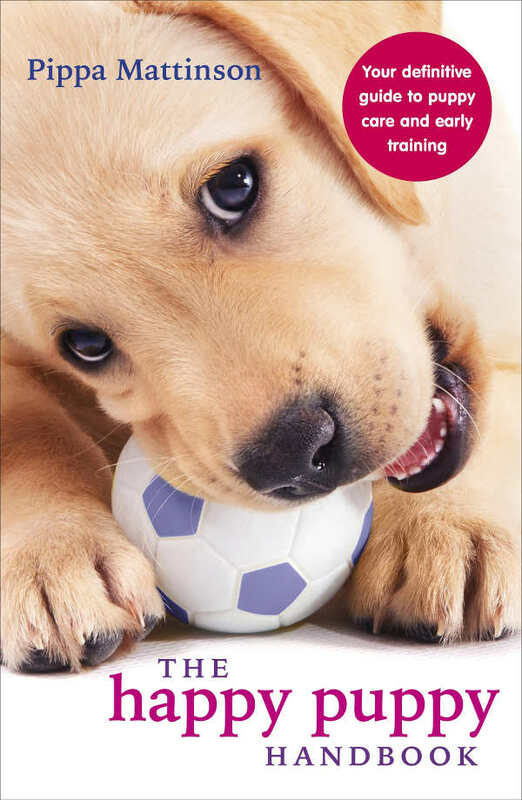 John Bradshaw’s excellent book ‘In Defence of Dogs’ brings together some great research which suggests that puppies come primed to make relationships with humans – even more than with other dogs. Humans are dogs’ main attachment figures, most commonly. And a puppy is in a stage of dependence, unlike an adult dog. So the ideal daily crate training schedule should involve periods of naps and resting in the dog crate, in between periods of play, socialization or training. How long can a dog stay in a crate? Ideally, a puppy is crated for the periods of time in between these other ‘events’ in the daily schedule. So – a training session, a play… and a nap (in the dog crate). Out to toilet, a training session, out for a socialization trip… and a nap (in the dog crate). And so on. This is the ideal use of the puppy crate. Think of it being like a baby’s ‘cot’ – it’s where you put the pup for nap-times. Puppies, like babies, need a lot of sleep since this is a period of rapid psychological and physical growth. Occasionally, due to the owner’s work commitments, puppies may need to be crated for longer periods of time. Have you taught the puppy to relax and be comfortable in the crate whilst you are at home, first? If not, you risk creating separation anxiety through going out. Follow the steps outlined below here, before you leave your puppy. Is the puppy tired, and ready to have a nap? Are you able to meet your puppy’s daily needs, outside of the time she is crated? As a rule of thumb, it’s probably best to consider 4hrs as the maximum continuous time on a regular basis for a 12wk+ puppy, which has gone through the following crate training protocols. Although dog crates are a fantastic tool, like any tool, they can be misused. Leaving your dog crated many hours a day, on a daily basis, is not acceptable. Excessive use of dog crates, is arguably what gives crates a bad name, and leads to some people considering them ‘cruel’. But this is not due to the use of the crate – but to the abuse of it. If you work only a couple of days a week, or part-time, try to take some holiday time off for a couple of weeks, to settle your new puppy in, and to establish routines. When you return to work, arrange for someone to visit your puppy, let her out to toilet, play with her a couple of times a day and (once she is tired) re-crate her with a tasty kong. You may be able to find a friend or relative willing to do this, or a professional. If you work full-time and your adult dog can’t be given free range of the house, please use the services of a pet professional. Like a dog walker (to break the day up), or a daycare, or pet sitter. Don’t leave your dog crated for 8 hours a day. The only type of service I’d recommend for a puppy under 6 months, is a ‘puppy visit’ as described above. 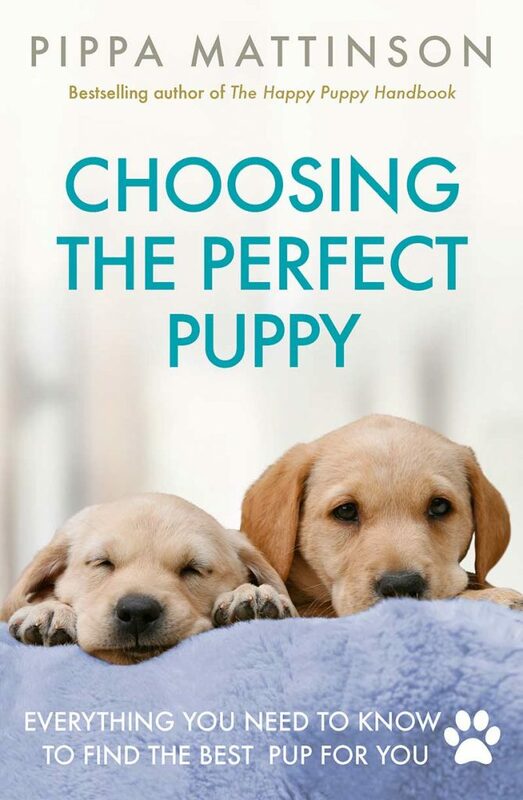 You can find a guide to having a puppy and working full time here. As soon as your puppy wakes up – and before she has made any noise – take her outside to toilet and remain outside until you’ve had success! When a puppy is very small, it’s probably best to carry her outside to prevent her going to the toilet on the way out. When your puppy is slightly older and toilet training is more advanced, you can lead the way outside. Try to ensure that your puppy is ‘empty’ before crating her, to reduce the risk of accidents in the crate. As you get to know your puppy, you will learn her toilet routine and this will make things easier. Where to put the dog crate? Put the puppy crate in the location where you want it to be eventually. This should not be in an ‘out of the way’ room – like the utility room, or entrance hall. It should be a ‘family’ room. The room where you hang out and spend most of your time at home, together. This is important because you want the puppy to associate the crate with your reassuring presence (helpful for providing security when you start to leave the puppy). And also you don’t want the puppy to feel excluded or ‘banished’ when crated. Often the kitchen, family room or TV area are the best locations for a crate. If you are worried about the appearance of the crate in your home, then you might like to consider a wooden one. 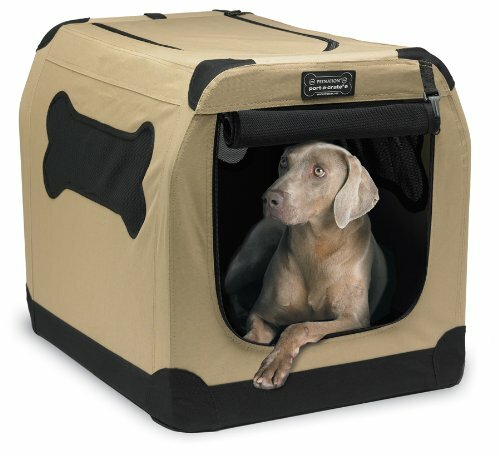 What to put in the dog crate? Anything that you choose to put in the puppy crate, you need to feel confident about the puppy having access to, when unsupervised. For that reason, it may vary from one puppy to another. Some puppies may benefit from a crate mat, to provide a softer bed. Other puppies may rip up a crate mat and might be better left with just vet bed. 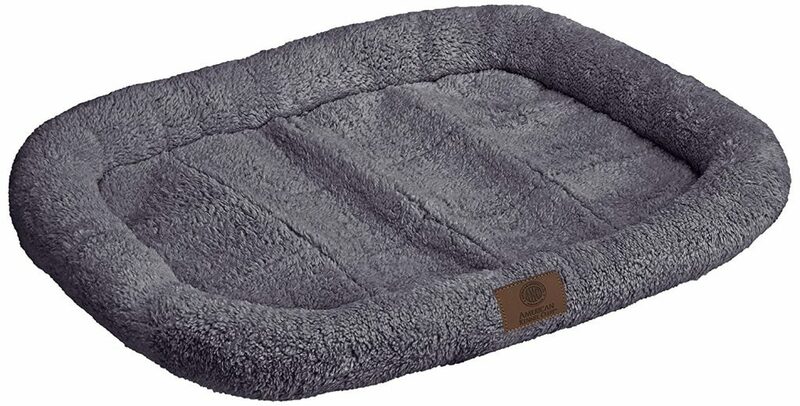 Either way, you will need to provide your puppy with some kind of reasonably comfortable bedding. If a puppy is very young or small, often a big soft toy or two, can give them something to cuddle up to. Since they will be used to sleeping with their littermates. However, a larger more destructive puppy, could de-stuff toys in your absence. Puppies will benefit from being left with things to lick or chew. 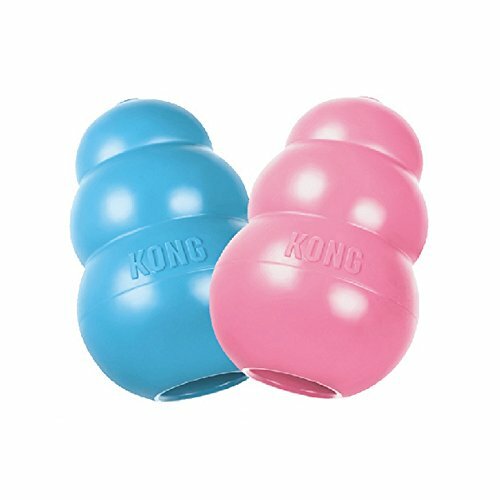 Stuffed Kongs are a great all-rounder, and should be made very ‘easy’ for young puppies, with lickable stuff right around the opening. (Puppies will give up if they are too difficult). Nylabones and other chews will need to be carefully chosen and assessed with your particular puppy in mind. Whether she is a strong chewer and whether she breaks off parts of the chew when eating them with you. Don’t leave a puppy with a chew you haven’t watched them safely eat before, several times. If you are only leaving the puppy for a max of 2-3hours, crated, then water isn’t necessary and can just result in all the bedding ending up wet when the puppy digs around and spills it. When you bring your puppy home, your first task is to help her feel safe in your house and safe with you. Forget about leaving her alone, for the first couple of days and even (preferably) nights. She has had a lot of stressful changes. Now is the time for settling her and helping her feel safe again. Put her bed by your bed. If you don’t want her in the bedroom, as an adult dog, carry her in and out. She won’t learn to find her own way in, like this. If your dog crate doesn’t fit by your bed, or is difficult to move about, use an open cardboard box for the first couple of nights by your bed. Take her with you when you go out if possible, or have someone sit with her at home if you can’t. Take some time off work, if you can, to settle her in during this time. During the days, work on ‘Stage 1-3’ of puppy crate training (below) with the crate in the regular daytime location where you want it to be. After 3-7 days of this, your puppy should be ready to spend nights in the crate in that location too – and no longer need to sleep by your bed. Sometimes pups can make noise when distressed or separated from you – which is why I advise having the pup by your bed at first. That way, you can just lay a hand on the pup and she will not feel alone, and will go back to sleep. You will find it easier to tell whether your puppy needs the toilet, or is lonely, by removing the ‘lonely’ variable! During the night, I would really advise you to set your alarm and take your puppy out to toilet. At first, this may be as often as twice a night (2am and 6am, for example), but very quickly will only be once a night. Do not wait for your puppy to make noise and wake you up – or you will end up reinforcing the noise by taking the puppy out. Instead, set the alarm and wake the puppy up even if she is asleep. Do not talk to the puppy or play with her, just return her to the dog crate afterwards and then ignore any subsequent noise – because you know she is empty. If you wake up before your puppy does, set your alarm for 30mins later the next night. Continue doing this until you get right through the night. If your puppy wakes up before you, set your alarm earlier the next night – so you are sure to wake up before your puppy – and remain at that time for several nights, before making it later each night again. So what’s the best way to crate train puppy? Every pup is an individual. They may be ok without following any of the below dog crate training protocols. Some owners just stick their puppy in the dog crate and close the door from day 1 – and their puppy still ends up just fine with the crate. Other puppies are ‘difficult’ puppies, which need very gradual and progressive moves towards being left alone, crated. And these puppies can be set back considerably if just shut in there from day 1. It is always best to be cautious and progress through the steps in order. You can do no harm, this way, if you have an ‘easy’ puppy. But you will avoid creating problems, if you have a ‘difficult’ puppy. So, this cautious approach is the best way to crate train a puppy. This stage involves the crate door remaining open, and conditioning the puppy to LOVE the crate. Do NOT close the door, at this stage. Hide some tasty treats at the back of the puppy crate, with a trail leading towards the door. Try to do this when the puppy isn’t watching, or is in another room. Allow the puppy to ‘discover’ the treats of her own free will, the next time she passes the crate. Then replenish them, when she’s not looking! The idea is that the puppy comes to think of the puppy crate as a magic treat-producing place… Do this as often as you can. You can also feed the puppy her meals in the crate: Place the bowl at the back of the crate, so she stands in the crate to eat. Remember, don’t be tempted to close the door. Try putting the crate next to you when you watch TV, and sit on the floor by it. The puppy may choose to go and lie down in there. Don’t ‘make’ her or encourage her to, verbally, yet. Drop a few treats inside, if you want. If the crate is small enough and portable from the day-time location, put the crate next to your bed at night and, at night only, you can close the door at this stage: Most puppies will accept being shut in, at night, if you are right next to them. Some crates open on the top, and you can then reach a hand in, to place on the puppy to settle her, so she doesn’t feel alone. Feel free to cough or sniff, or talk between yourselves, if the puppy seems anxious – so she knows in the night that you are right there. Take her out to the garden first thing in the morning to toilet; don’t leave her shut in there whilst you get up. After a day of Stage One of how to crate train a dog, if the puppy seems fairly comfortable with the crate and is frequently checking it out as a magic treat-producing place, you can move onto Stage Two. This stage involves shutting the door, but without you leaving the puppy. Prepare a fantastic stuffed kong. Try some pate, some cheddar cheese (which you can melt in the microwave once you’ve put it in the kong, so it is harder to get out! ), mashed banana, peanut butter – just a tiny smearing of these, around the opening of the Kong. Make sure the puppy has been to the toilet and is empty, and also is tired – after a vigorous play session or socialisation trip, for example. Throw the Kong in the back of the crate and shut the puppy in there when she goes in. Sprinkle some treats in there too, for good measure! Sit next to the crate and work on a laptop, or mobile device or read a book. You should physically be right up next to the bars of the crate, at first. Do not leave the crate whilst the puppy is in there. Fido should eat the Kong happily, as you’re right next to him. Occasionally drop some more treats into the crate, especially once the Kong is finished – as long as the puppy is quiet. If the puppy makes any noise, ignore it. Don’t speak to her, or shout at her. Don’t drop treats, in response to noise – or you will reinforce the noise. Wait for quiet before giving treats. Put the subtitles on, if you’re watching TV!! Hopefully, by the end of the film, Fido is not making noise and is settled. Let her out. The noise your puppy makes at this stage, is not about separation from you – it’s not panic, fear or distress. How do we know that? Because you’re sitting right by the crate. That is why it’s so important to do this: If you move away from the crate at this point, and the puppy makes noise, you will be unable to tell the difference between 1) noise which is genuine distress, panic and fear about being separated from you – which should not be allowed to continue, or it may become associated with the crate – and 2) an angry frustrated ‘I WANT’, sort of noise, which really should be ignored, so the puppy learns it doesn’t work. Through sitting next to the crate, you can be pretty sure that any noise which happens, is about frustration – because there is no separation! Noise due to frustration, is very safe to ignore. It may go on quite some time. It may be loud, intense and the puppy may get worked up – in quite a similar way to a child throwing a tantrum when told they really can’t have what they want. If you ignore it, it will eventually stop. Remain at this stage until Fido is totally chilled lying in the crate whilst you sit next to it. This will hopefully only take you a few days – unless your puppy has an existing issue with the crate, and/or a bad experience of having been crated in the past. In which case, proceed much more slowly and don’t be in a rush to progress until the puppy is happy with the stage you’re at. You will be crating the puppy in the closed crate at night by your bed, during this time. Often puppies accept crating at night more readily than crating during the day. This may be because they are more sleepy at night whereas there may be angry protests about it, during the day. Just because your puppy is fine at night, in the crate, don’t expect this to necessarily also be the case during the day. 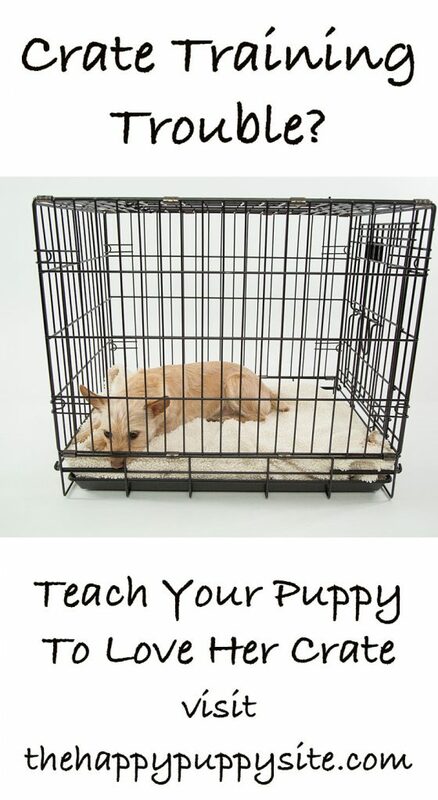 You need to practice crate training a puppy at night and during the day. This stage is about the puppy being comfortable in the crate whilst you’re at home – but not right next to the crate, anymore. Crate the puppy (always with a tasty Kong, always tired and empty of pee and poop), whilst you do some activity in the same room. Like cleaning, working at your computer, cooking etc. Make sure you do some stationery activities (reading, computer, eating) and other activities involving moving around (cleaning, cooking). As always, ignore any noise. Periodically return and drop some treats into the crate if the puppy is quiet. Do not do this if the puppy is sleeping, as obviously we don’t want to wake her up! With crate training a puppy generally, make sure the puppy is not just continuously eating in the crate, as puppies need to learn to be relaxed and ‘ok’ when there is nothing to preoccupy them – if all your training relies on continuously feeding the puppy, when the crating time grows longer, they may not be able to cope once they have finished their Kong or treats. So it’s good practice to ensure the puppy has finished Kong/treats and is still ok, before finishing a crating session. The Kong doesn’t need to have much in it – it is a gesture to continue to make the crate a great place to be, rather than an hour-long chewing activity. Once the puppy is comfortable with this, start to undertake activities in other rooms of the house. Keep the door(s) open between you and the puppy, and start out with a room nearby – progressing further away as the dog can cope. Choose active, noisy activities at first – so the puppy can hear you and knows she is not alone in the house. Feel free to sing to yourself, talk to yourself… Ignore any noise from the dog. Remember: Whenever the puppy is crated, he gets a tasty Kong; is tired; and empty of pee and poop. If the puppy is ok with this, make the activities quieter until you can sit in another room and read, periodically moving in to check on the pup and then away again. At this stage, the crate really starts to become useful. Use it any time you need to, when you can’t supervise your puppy and you’re at home. Cooking? Eating? Getting kids ready for school? Showering? Cleaning? Use the crate. You’ll be secure in the knowledge that your puppy isn’t going to the toilet somewhere and isn’t getting into anything she’s not supposed to. Stair-gates are also useful at this stage. If you don’t want the puppy upstairs or in the kitchen or [insert place], a stair-gate is another intermediate form of separation which involves the puppy being able to see and hear you – but not be with you. Do not leave your puppy crated when you go out, yet. Ideally, don’t leave your puppy alone at all, just yet! Bring her with you in the car, ask a friend or relative to sit with her, if you need to go out. Although all this (to this point) might sound like a lot, it’s actually not – and can be achieved in 3-5 days, with a puppy which has no previous problems with the crate. Always make sure your puppy has been to the toilet and is ready for a nap. Every time you crate, do it with a stuffed Kong. Crate your puppy. Put on your coat/pick up your keys/get ready. Use a specific phrase which tells your puppy that you’re leaving (‘I’ll be back’; ‘See you later’). Go out, and immediately come back in again. Don’t look at your puppy too much. Pretend you quite like to do this crazy going-in-and-out thing for some personal reason, known only to yourself. Walk around the room. Say your phrase, go out again, and immediately return. Repeat this many times, until you see the puppy stop being at all interested in what you’re doing, and either become absorbed in the Kong or doze, in a relaxed state. Ideally your puppy is scarcely paying much attention to what you’re doing, but even if your pup is more interested, she should be lying down – or don’t progress yet, until she shows more signs of relaxation. Then, as above but now go out and wait 5 seconds. Return. Repeat until puppy is relaxed. Go out and wait 10 seconds. Repeat until puppy is relaxed. 30 seconds. Repeat until puppy is relaxed. 1 minute. Repeat until puppy is relaxed. You may progress through all this in one or two sessions. Or, if your puppy becomes hyper-alert and worried when you go out, it may take you a week going back a few steps, with several mini-sessions a day. A lot depends on your individual puppy. 5 minutes. At this point, you might like to start walking away from the house, then turn and walk back to the house again. Repeat till puppy is relaxed. 10-15 minutes. If you have a corner shop near you, go and get the paper or some milk. By the time you reach this sort of length of time, the number of repetitions you’re going to be able to do each day is much fewer. (Many times 15 minutes probably equals a good amount of your day!). But try to get a couple of sessions in, each day. The good news is that the first 15 minutes of being left is the hardest time for any puppy, and the time when separation anxiety is most likely to kick in. If you’ve reached this length of time with no problems, it’s highly likely you’re almost home and dry. Well done! Gradually progress: 30mins; 1hr; 1.5hrs; 2hrs; 3hrs. And so on. Once you are past the first 15 minutes, you can increase in much larger chunks of time. Ideally, try to ensure your puppy is ok being left for the maximum amount of time she will need to be left for. If you’ve taken time off work, how long will your puppy need to be left for, when you return? Can you plan how to reach that time, before you return to work? It’s important to start crate training a puppy from the day you bring your puppy home, beginning as explained above. You will need a good crate training puppy schedule. In the first few days, you will have the dog crate by your bed at nights – closed – or (if possible) open only on the top so you can reach in to stroke your puppy when needed. If this isn’t possible, use a cardboard box which your puppy can’t jump out of – again, open on the top. During the daytimes of that first week, you will be working on Stage 1-3 above with the crate in the location where you want it to end up. After a few days of this crate training ‘puppy schedule’, your puppy will also be able to spend nights in the crate in its permanent location, and will not need to be by your bed – because she will have settled in with you and will now associate the crate with your presence. Continue to work through the above steps, over the coming weeks. Since every puppy is an individual, it’s impossible to say how long the crate training ‘puppy schedule’ should take. Some puppies might progress through this within their first week or two. Other puppies might take months of very careful introduction to being left alone for gradually increasing periods. To some degree this is breed specific: Some breeds are known for forming very strong attachments to their owners and for being distressed when separated. These breeds are likely to take longer. Our Weimaraner took a few months to work on issues like puppy crate training, alone training and spending night-times apart from us. Our other puppies have only needed a couple of nights by our beds whilst working on puppy crate-training during the day – and by the end of the first week they were fine being left for short periods whilst we went out. If your puppy finds separation difficult, it is really important to follow the above protocols exactly and not to progress prematurely. Like all training, you can only go at your puppy’s pace – and you need to ensure your puppy is successful, before moving onto the next stage. If you progress before your puppy is relaxed and comfortable, then you risk everything falling apart at a later point of your training. 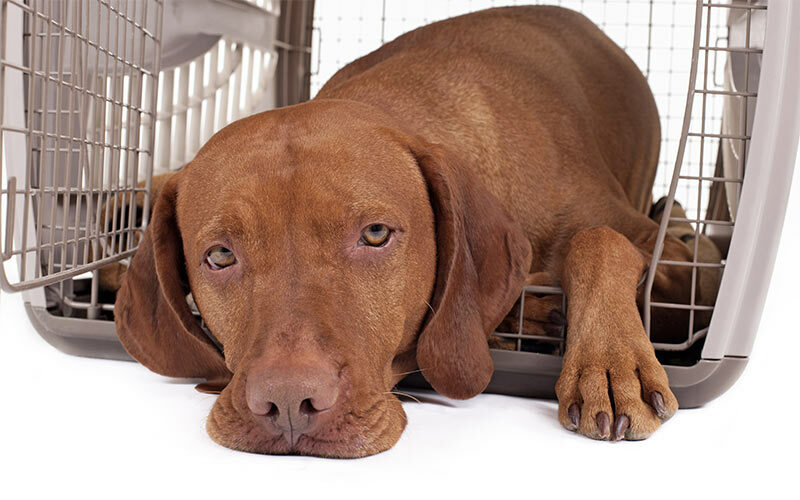 Is your dog whining in his crate? There are different noises a puppy can make in the crate and it’s important to try to identify what’s going on, emotionally, for the puppy, so you know how to respond. Sometimes the noise a puppy makes in a crate comes from frustration. This will sound like a ‘let me out of this crate, NOW, “I want…”’ noise. It can be very loud, persistent, and the puppy can become quite worked up – like a child having a tantrum when told she can’t have something. Other times, the noise will come out of panic and fear – anxiety. Is My Dog Frustrated Or Distressed? It can be very hard to tell the difference between these types of noise, especially if you are a new puppy owner. This is why it’s important to begin crate training dogs, by following the stages listed above. If the noise is one which your puppy has made when you’ve been sitting right by the crate, then it’s likely frustration – not panic due to separation. This is why it’s extremely important not to skip the step of sitting by the crate until your puppy is comfortable (stage 2). Not sure what is behind a noise? Assume it is fear-based to be on the safe side and return to crate-training basics as outlined above. If you know noise is frustration-based, wait for silence before going back: When you return when the puppy is making noise, your return in itself will reward the noise-making and the puppy can make even more noise next time because it makes you come back! If the noise is more of a low-grade dog-whining-in-crate noise, your puppy is likely bored or discontented and you may need to consider whether you are meeting physical and mental needs both in and out of the crate. Do I have to use a crate? No, of course not. If your puppy has no problems with eating parts of your house she’s not supposed to eat, AND your puppy has no toilet training issues, AND your puppy has no separation anxiety issues, then a crate is probably redundant. However, if your puppy comes without any of those issues at 8wks, she is probably Super-Puppy – it’s pretty unlikely! How long should I use the crate for? This depends on your individual puppy. You have had no toilet training accidents in the house for a month or more. Your dog is not at all destructive when out of the crate at other times – you never have to tell her not to chew something or to remove your valuables from her mouth. 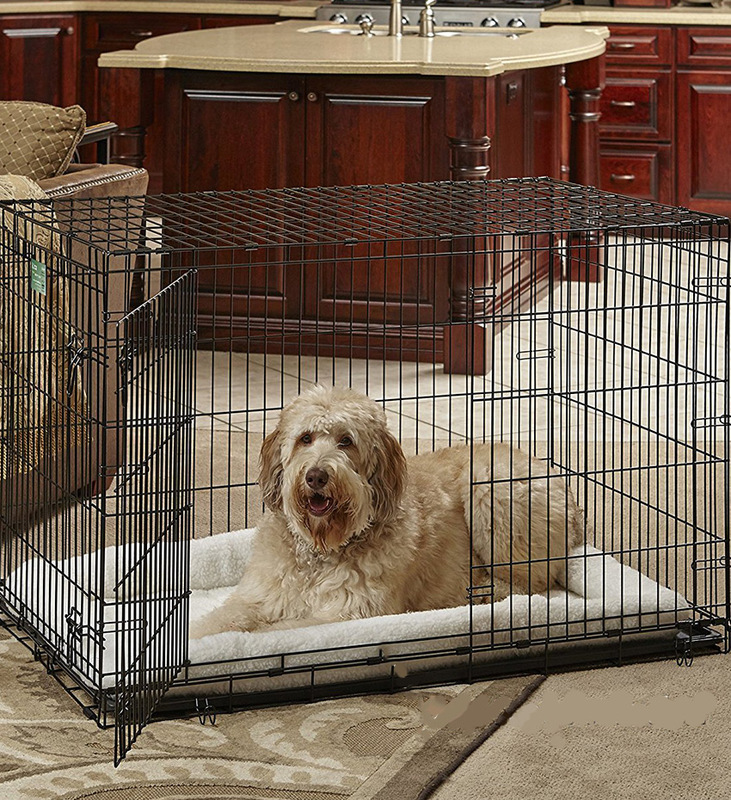 Your dog is settled and relaxed being left alone in the crate. If you have other dogs, you are sure you can safely leave the puppy loose with the other dogs without any dog suffering for it. It is best to err on the side of caution and to use the crate for too long, than to stop too soon. With my own (large, gundog) breeds, I use the crate at least until they are out of early adolescence (12-18months). How do I stop using the crate? When you stop using the crate, just leave the crate door open when you go out. If all is ok on your return after a few occasions, remove the crate and put the same blankets or bed which were inside the crate, in the same position, without the crate. You can then transition to a dog bed. Your dog will always ‘remember’ crating, and you should be able to return to using one at any point in your dog’s life – you will not need to re-train your dog if you want to use a crate again in the future. As long as you trained things properly the first time round! What about crate training a dog, not a puppy? When it comes to crate training dogs, keep in mind that there may be a history with crates. A crate training puppy doesn’t have that problem. Either way, you may need to progress more slowly when crate training dogs – as compared to crate training a puppy – but the general principles and the crate training schedule and protocols remain the same. Crate training a puppy is an important process. As is crate training a dog. Although it can seem a bit daunting, you will find that with a little effort your life with a dog will be vastly improved. You will have a safe, happy puppy with a lovely snuggly den. 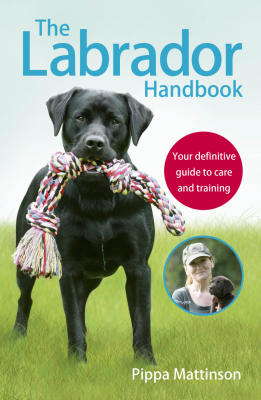 To get more great advice on caring for and raising your puppy, check out Pippa Mattinson’s brilliant guide – The Happy Puppy Handbook. Order your copy from Amazon here today. our puppy is 18weks old we are now trying to get her out of the crate as she is in the kitchen with our other dog .so during the day we have been leaving the door open all is fine with out her dog ,no destruction and no weeing ,so last night we left the door open came down this am and she had peed all over kitchen floor any ideas how we can stop this ??. Did you ever get an answer to this question!? It is exactly my question too but haven’t found the answer on the forum yet. Very good tips! Our first dog was already used to crate when we got her so the 1 to 3 stages was known, we will for sure make in practice those stages with our new pup. The only thing that concern me is to how to make them meet. My older dog is 4, the pup wiil be 9 weeks. I will make them meet in a neutral place but would love to read more about it , like the sharing toys and all the other things that we dont thi k about. Thank you so much for this article and your guidance. After the first three nights of our new 8 wk puppy being very unsettled. I found your article and followed it to the letter. We now have a puppy who is happy in his crate, sleeps the whole night and various naps throughout the day. He is now able to be left in it while I have a shower/ clean/ prepare dinner etc. He seems to be a pretty fast learner! I cannot thank you enough for your sensible, easily understood step by step instructions aimed at people like me, not professional trainers but a caring owner trying to do the best by their pet. Some articles I have found make owners feel like idiots, needless to say yours does not! Currently looking for a crate for my puppy. Was unsure about it but after reading it, it clear my uncertainties. This is very interesting articles. Got my labradoodle puppy 11 weeks old 3 days ago. I had the crate from before for my other dog it is bit big but Had no accidents since only first day use and in next morning cos I had to rush out to toliet she panic and peed. So I had been stressing out how to make the plan right still am. So here’s my story. On first day wire crate in my room end of my bed I had shown her the crate in and out with treats but she wasn’t keen on the treats so I got the toys play with her near it she got in and out then at night before bed I had put Kong in with honey and treat in she shown no interest so I did gently pull her in she went for abit with treat I closed door as I want her be safe and I am deaf but can hear with cochlear but I am used to it without it when bed did leave it on hopefully can hear if something, so anyway after she in the crate she scream went like in mental stage whining jumping it was horrific I had her right next to my bed then after I say 10 mins she calmed down when I in bed she went fine went asleep but when day time she wouldn’t go in but I did put her food bowl in with door open she was unsure go in or not but she got in then go as normal then I tried play with her in with treats she did went in but quick out she’s very stubborn one and pretty destructive so each night now 3rd night all bit simialar situation but tonight bit better still the whines and bit screaming banging her head in but I had to go toliet. Last 2 days I couldn’t crate her in day time she did been sleeping on my couch but tomorrow will have to try because I took this week off work. So what I am asking is do I gently try push her in crate if she won’t stay in? Today she been fine went in eat her bowl I get nervous next day if I make it worse. I only have one crate in bedroom abit of hassle to be moving it around I know need see me etc. I’ll have someone come out next week when I go back to work so. She may be locked up for about 3-4 hrs until a friend comes in. So is it ok to use just a bit of force of course with no punishment just play with her then put her in slowly but a little push in.